Feel free to download the PDF of emails. Enclave Nashville takes Buddy and his, ahem, objectivity, apart in "CM Buddy Baker has to break out of his huddle with the lawyers tonight to pass an unpopular alley abandonment"
NewsChannel 5 aired a television segment with interviews of Buddy Baker and Rick Bradley on the evening of the July 20th Council deferral of the road abandonment bill. Watch the video and read the transcript online at "Controversial Alley Proposal Meets Dead End"
Nate Rau continues the Tennessean's web coverage of the issue with an article about the indefinite deferral of the road abandonment bill, "Controversial alley abandonment to be deferred"
Joey Garrison of the City Paper writes about the outcome of the July 20th 3rd reading on the road abandonment bill in "Councilman defers controversial alley abandonment"
Enclave Nashville on all the shady and suspicious things to come out at Buddy Baker's July 17th community meeting, in "What Metro Council Member Buddy Baker supported and when he supported it"
Nate Rau of the Tennessean gets on a roll and uncovers a "smoking gun" email from February. Bob Leeman of the planning commission outlines Councilman Buddy Baker's knowledge of the "long term plan to rezone the res­i­den­tial prop­er­ties to indus­trial and con­sol­i­date all of the prop­er­ties." Read about it in "Councilman indicated alley closure was tied to industrial rezoning"
The Tennessean's Nate Rau zeroes in on campaign finance issues and the Saturday, July 17th, community meeting in "Battle lines drawn on West Nashville alley abandonment"
Joey Garrison of the City Paper wrote an article about the July 17th community meeting called by Councilman Baker at the property in "Final public meeting set on 43rd Avenue alley controversy "
Mike Byrd continues following our issue with a note about Councilman Baker's own personal community meeting, "Buddy begrudgingly bends to constituents on contested alley abandonment "
In an article reporting about the reporting about our story, Enclave Nashville highlighted the confusion surrounding a high-profile murder case purported to be associated with the 43rd Avenue alley, but which isn't... "Tennessean journo links body to rezoning issue "
Chris Wage covered our story for the Nashville Scene's "Pith in the Wind" section with "West Nashville Land Grab: Will There Be a Buddy Baker Memorial Waste Plant? " Mike Byrd highlighted the connections between Councilman Crafton's "English First" campaign and the 43rd Avenue abandonment (nee rezoning) in his article "Same team that tried to force English Only on Nashville tries to flip residential neighborhood industrial"
Read the City Paper's coverage of the Thursday July 1st community meeting! "Alley removal pits west Nashville neighbors against councilman"
Fox 17 Television aired a brief segment on the closure/zoning issue. The online transcript is here: "Councilman Favors Alley abandonment"
The Tennessean had a short article about the Thursday July 1st community meeting "Neighbors discuss alley abandonment"
Juanita Cousins of The Tennessean wrote an article continuing their coverage of the 43rd controversy: "Metro may close alley that attracts drug dealers, trash"
Channel 4 News aired a June 14th segment on the 43rd Avenue abandonment featuring Councilman Buddy Baker and Nations resident Rick Bradley. (May 19, 2010) Enclave Nashville ran an article titled "A West Nashville neighborhood needs your help"
(April 22, 2010) The Tennessean ran an article titled "City ponders closing alley that attracts prostitution, drug deals, trash". Watch video from the July 17th community meeting held *at* the 43rd Avenue property. Download the full video here. Watch video from the July 1st community meeting held in the Nations Neighborhood. Sorry -- the audio is very faint in a lot of places, but this is the best we can do at the moment. If there's a demand we'll see about remastering the audio. Watch Planning Commission Meetings from April 8th, 2010, and June 10th, 2010. Residents in the area are doing daily drive-through's at the property / road / alley in question. You can find each day's set of snapshots here. We also have a number of older photos taken at the location. See this entire set, taken in early April, on flickr. Mike Peden was also kind enough to let us use his photos of the same site, taken in early May. Click here to see his entire set. Notice that the property owner is dumping material inside his own fence. Also, note the empty truck trailer. 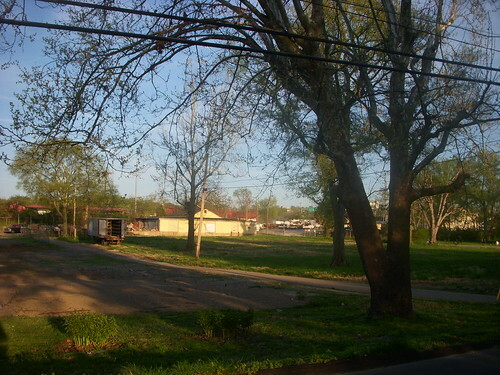 At the April 8th Planning Commission meeting the property owner stated that he had arranged for someone to remove that trailer and that it was "probably already gone". 5 weeks later the trailer is still there. A concerned neighbor requested the crime records from Metro Nashville & Davidson County. We've made the arrest records available here. We've taken out the identifying information about who committed the crimes, but otherwise these are the complete arrest records for the surrounding area for the past year. This includes arrests made up to 10 or 12 blocks away from the site in question. Our layman's assessment is that the property in question has a lower incidence of crime than the Nation's neighborhood as a whole!